Could this be any more British? From a Vanquish S inspired by the Red Arrows acrobatic airplane team, to a V8 Vantage S celebrating the automaker’s British heritage, special edition Aston Martins aren't exactly in short supply right now. The new DB11 luxury grand tourer is the latest car in Aston Martin’s line up to get the bespoke treatment with a one-off model celebrating the carmaker's partnership with the Henley Royal Regatta, a prestigious rowing event held annually in London on the River Thames. 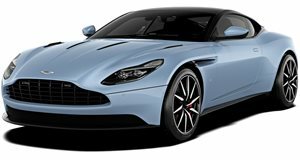 Dubbed the Henley Royal Regatta DB11, the one-off special was designed by the Aston Martin Design Team using unique parts from the Q bespoke division. Setting the Henley Royal Regatta DB11 apart is an exclusive Diavolo Red finish combined with a stylish Satin Scintilla Silver roof. Carbon fiber finished in satin is used extensively on the exterior, covering the front splitter, side sills, rear diffuser, side strakes, hood blades and mirror caps. Adding to the luxury coupe’s dark aesthetic is a set of 20-inch Gloss Black Directional wheels with diamond turned faces and smoked taillights. As you would expect, the same attention to detail has been applied to the lavish interior. The Aston Martin Design Team chose an interior scheme that reverses the exterior colors, opting for Metallic Black Leather upholstery with flashes of Chancellor Red leather on the seats and door panels with matching contrast stitching. Obsidian Black Alcantara is also used on the headlining and cantrails, while a Shadow Chrome Jewellery pack adds another layer of sophistication to the meticulously crafted cabin. Performance is identical to the standard DB11, which is powered by a 5.2-liter twin-turbo V12 that produces 600 hp and 516 lb-ft of torque. All that power is sent to the rear wheels via an eight-speed automatic, allowing the grand tourer to sprint from 0-62 mph in 3.9 seconds and hit a top speed of 200 mph. The one-off DB11 will be shown off at this year’s five-day Regetta event from June 28th - July 2nd on a special display alongside a range of iconic sports cars from Aston Martin’s illustrious history.